Aims During the period 2003/4–2009 there was an almost 3-fold increase in the incidence of tuberculosis (TB) in children in Greater Manchester (GM). The aim of this investigation was to understand the factors driving this increase, with a view to improving prevention and reversing the increasing trend. Methods Data were prospectively collected from paediatric TB cases diagnosed within GM between 1 January 2012 and 31 December 2013. Cases were GM residents <16 years at diagnosis. Information was collected from the parents/guardians of each case using a standardised proforma, where possible at the initial clinical consultation. At the end of the investigation period, teleconferences were held with each clinical service to assess the potential preventability in the UK setting of reported cases. Results 60 TB cases were ascertained during the study period. Proforma were completed for 56/60. 57% were male. Age ranged from 0–15 years with 32% of cases under 5 years of age and 21% of the cases 15 years of age. Over half of the cases (31/56 (55%)) were UK–born, 9/56 (16%) were born in Pakistan and country of birth for the remainder was distributed across 11 different countries. A total of 17 cases (30%) were judged to have been potentially preventable. 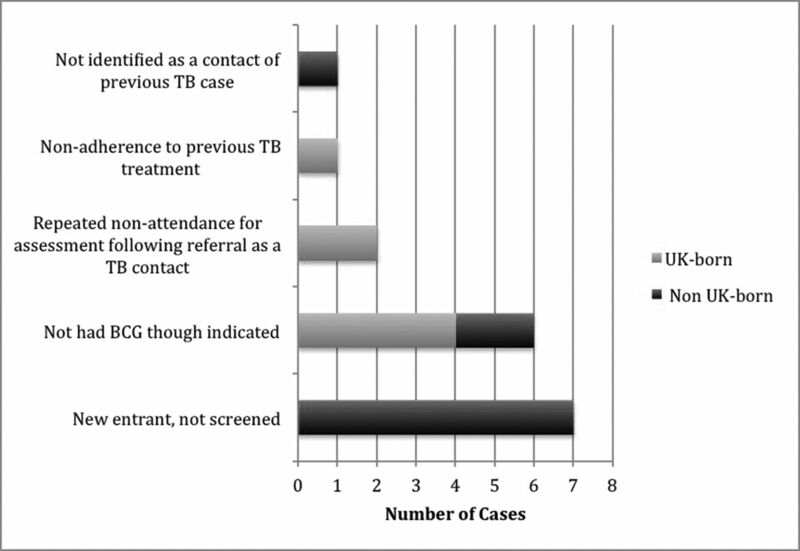 Figure 1 shows the factors contributing to preventability by number of cases. 7/17 of the potentially preventable cases were UK-born. Conclusion A third of cases for whom data collection was completed were judged to be potentially preventable. The two main themes that emerged were failure of the new entrant screening process and failure to be vaccinated with BCG vaccine despite being eligible. In order to reduce the burden of paediatric TB, it is important to ensure effective mechanisms are in place to maximise ascertainment of eligible new entrants to the UK. With regards to BCG vaccination, a review of arrangements across GM is currently underway.